FC Barcelona Regal smothered reigning champion Olympiacos Piraeus en route to a 76-68 victory at Palau Blaugrana on Friday night. 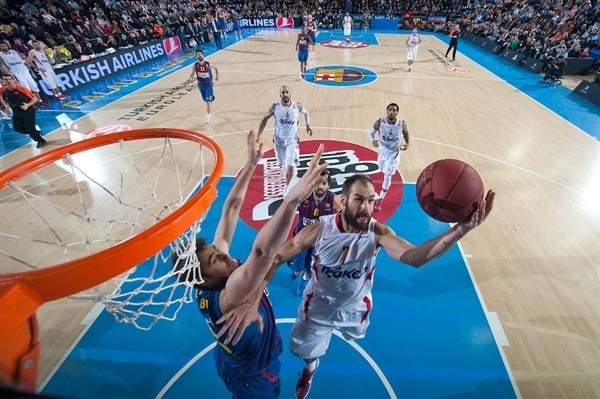 Barca kept Olympiacos star Vassilis Spanoulis to a season-low 9 points in rolling to a victory, which keeps Coach Xavi Pascual’s men one-victory behind the Group F leaders. Olympiacos dropped to 1-2. Barcelona was in control for much of the contest and though the Reds got within4 in both the second and third quarters and within 6 in the fourth, they were never able to get within one possession. 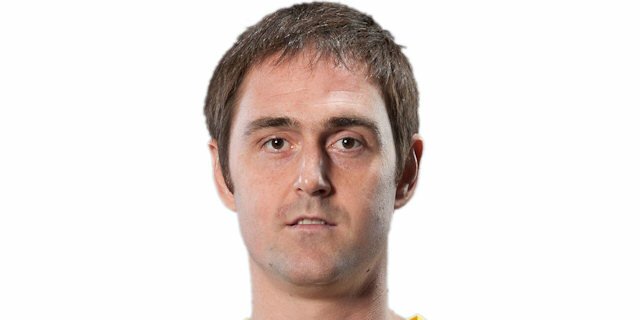 Ante Tomic paced Barcelona with 15 points and 12 rebounds. Pete Mickael posted 12 points and 4 blocked shots and Marcelinho Huertas, Sarunas Jasikevicius and Victor Sada netted 10 each. The bad news for Barca is that scoring king Juan Carlos Navarro, who was closing in on his 3,000th career point, left the game in the third quarter with an injury. Georgios Printezis was the top scorer for Olympiacos, which shot 38.4% from the floor in the game. Spanoulis finished without a three-pointer for the first time all season and had 5 assists, but 4 turnovers. A quick three-pointer from Kostas Papanikolaou gave Olympiacos the early advantage, and it wasn't until almost two minutes in that Barcelona opened its account. That came from a Mickeal layup. Navarro hit a layup that put Barcelona ahead for the first time, 8-7. A run of 6 unanswered points extended the lead for the Spanish champs before the first timeout. Straight after, a Navarro floater made it 16-9 and Nate Jawai showed off his defensive skills with a huge block on Acie Law. 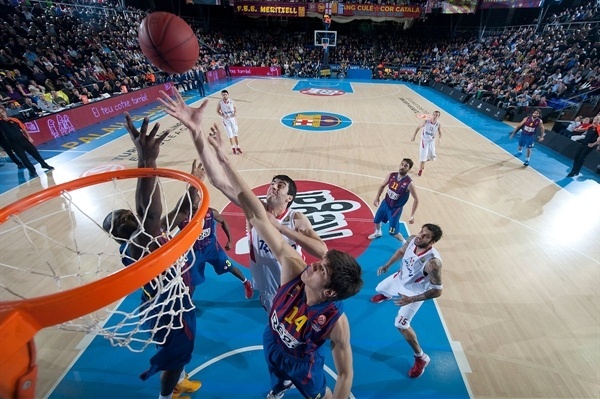 Two disallowed Barcelona baskets had the fans at Palau Blaugrana on their feet, only adding to a fantastic atmosphere. 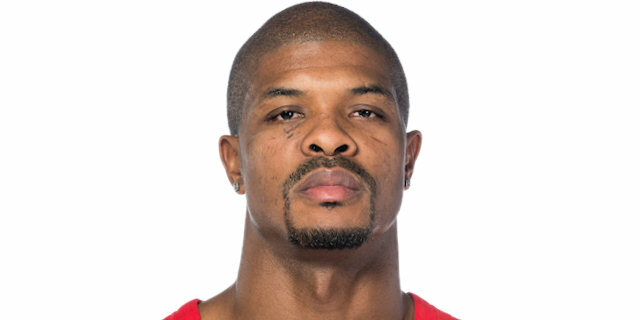 A pair of blocks for Jawai and defensive rebounds for CJ Wallace showed the home side's ability to keep Olympiacos quiet – in particular Spanoulis, who had just 2 points to his name at the end of the 18-13 first quarter. 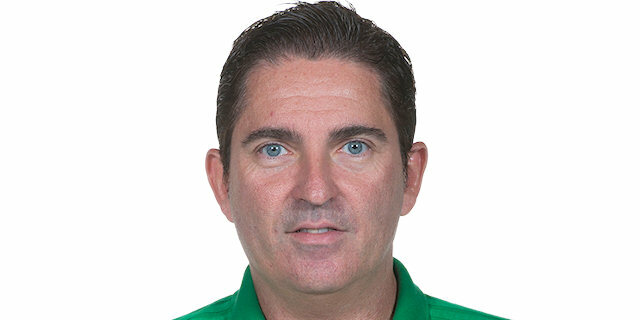 A triple from Sarunas Jasikevicius gave Barcelona an 8-point lead to start the second quarter, and the difference was kept up by a smooth three-pointer from Marcelinho. Olympiacos's response wasn't pretty, but it kept the road team in contention: Close range layups and trips to the free throw line made it a 4-point game. 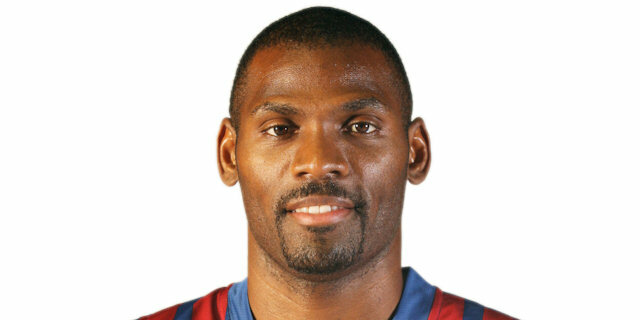 Shutting the champs' strategy off, Mickael took over from Jawai as Barca's shot-blocking king midway through the quarter, with 2 rejections in rapid succession. Spanoulis began to get into the game for Olympiacos with a series of drives down the lane, but there was only mixed success for the star guard as Barcelona showed off its strong defense. Olympiacos needed a big presence in the paint and got one in the form of new signing Giorgi Shermadini -on both sides of the court. Shermandini put down 6 points in the quarter and was able to keep Barcelona from dominating inside. Trips to the foul line for both sides slowed the pace of the game down, until Jawai erupted with a highlight-reel worthy alley-oop off Navarro's pass. Barcelona was in control come halftime, with a 41-32 lead. Georgos Printezis began the fight back for Olympiacos after the restart, sinking a nothing-but-net triple, a two-pointer in the paint and another basket from beyond the arc. Spanoulis joined in the third quarter scoring, as an Olympiacos side that had shot with just 34% accuracy in the first half became more clinical. 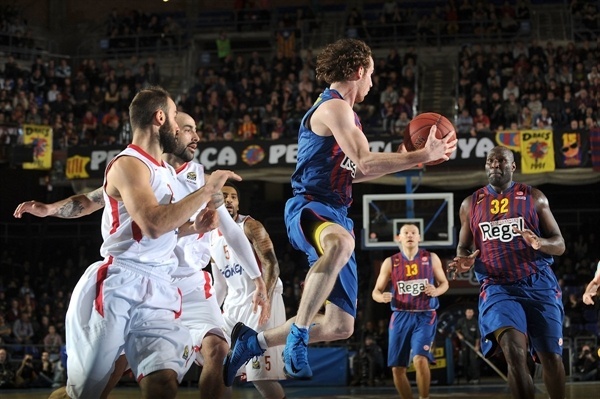 Barcelona used the inside games of Erazem Lorbek, Tomic and Mickeal to maintain a lead that had been held since the opening quarter. Olympiacos briefly cut the gap to 4 points, before the home team regrouped and went 60-52 at the end of the third quarter that was capped by Tomic's graceful dunk. Marcelinho led the Barcelona charge in the fourth quarter, as he reset the lead to 11 points with energetic drives inside and a flashy behind-the-back assist for Tomic. The Brazilian guard replaced Navarro, who hobbled off in the third quarter and was rested from then on. Olympiacos resorted to outside shots in an attempt to cut the deficit and Pero Antic hit two clean three-pointers in succession. Evangelos Mantzaris sent down another for Olympiacos, taking the score to 74-66 with just three minutes left on the clock. 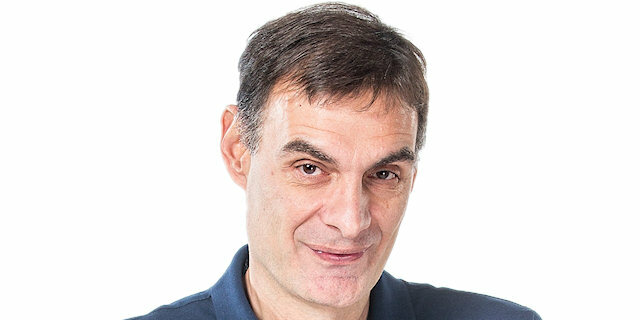 The hustle of Jasikevicius looked to have Barcelona in a position to run down the game, but a foul gave Olympiacos two possessions in which to pull back a 6-point deficit. 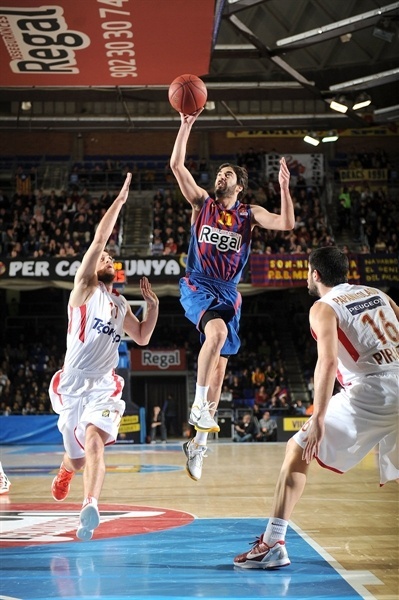 The Greek champs were unable to do so, and a trip to the foul line for Victor Sada sealed the win for Barcelona, 76-68. "I'm happy with the victory. It was a great game aganst a great team, the reigning champ, and we had to work our gameplan well. We were strong on defense and we really showed our quality. We were brilliant defensively and stopped their pick and roll well. They are a difficult team to contain and we did a good job with that. We had players lke Tomic who were rebounding well and showing their quality, against players like Kyle Hines who are specialists at this. We are happy, it was also a great Euroleague atmosphere here and I thank the fans. I think having everyone behind us here is the key for us. Juan Carlos Navarro has suffered a hamstring pull, he will undergo an eccography to assess the condition, but it looks likely that something is torn. We will know more soon." "We didnt play as well as we wanted. We needed a better game to win at this place. Some refereeing decisions weren't so good, and some of our decisions too. Our 2-pointer percentage was very low. We could not take what Barcelona's defense gave us. Congratulations to Barcelona for the win. It wasnt going to be easy to win here, but we have to look at the next game and move on. In the Top 16 it is tough and there are many good teams, so we have to forget the defeat quickly, analyse our mistakes and learn from them to continue. Barcelona's defense was great, but it has weaknesses that we had analysed before. We didn't take what they gave us. This was a problem for us. We didn't take some smart decisions." "It wasn't too much a case of revenge. It was just a game; a game we have to win, that we won. That's the most important thing. We weren't thinking about revenge. We were thinking about this Olympiacos team this year. We wanted to win, we won by eight points which is a very good number, because now we have to go to Olympiacos and play in the future. Every point matters. Whether we wn by one or win by ten, every point matters." "It's kind of revenge, but it's just one victory. It's very important to win at home at this point, in the Top 16. We have to keep going on. I think we played better today, he whole team was really god and we managed to do what we wanted." "They just played with more energy than us. We didn't execute the game in the way that we should have. Defensively we didn't play with us much pressure on the ball as we should have. I don't know if it wasn't just the little things, the small details. When the energy was there and the hustle was there, we were just missing a few little details. We were getting to our spots, getting to our plays, but just finishing the open shots that we weren't knocking down was a problem. I think that was the biggest key for us tonight. We'll get back to work on this and try to improve these small details. It's going to be fine tuning and trying to correct our mistakes very fast, because we don't have much time. "